We’d love your help. Let us know what’s wrong with this preview of Show Barn Blues by Natalie Keller Reinert. Grace has built her life on show horses. It's been a good life, too -- she mounts her wealthy students on European warmbloods, competes her horses on Florida's rigorous A-circuit, and runs the nicest barn in the neighborhood. Then, suddenly, it's the only barn in the neighborhood. As Grace's country town becomes a sun-drenched playground of pools and golf courses, she vows Grace has built her life on show horses. It's been a good life, too -- she mounts her wealthy students on European warmbloods, competes her horses on Florida's rigorous A-circuit, and runs the nicest barn in the neighborhood. Then, suddenly, it's the only barn in the neighborhood. As Grace's country town becomes a sun-drenched playground of pools and golf courses, she vows that no bulldozer will ever touch her farm. With her neighbors selling their farms and moving to more isolated corners of Florida, she finds herself fighting off land-hungry developers alone -- until Kennedy comes along. 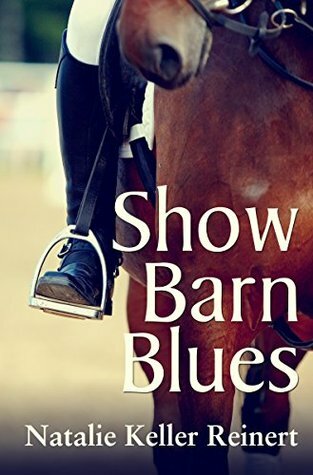 To ask other readers questions about Show Barn Blues, please sign up. Loved this book! What an interesting, behind-the-scenes look at a high end show barn. Grace was such a strong leading character I felt very much invested in her story arc. Fun too that she was an older lady instead of the often more typical "young, beautiful heroine" - her complete acceptance of her age and her comfortable-in-her-own skin demeanor was a breath of fresh air. Also love how this book ultimately line up with the Eventing series. Show Barn Blues brilliantly captures the bizarre social dynamic present at so many show barns: on one hand, on some level most professionals who work with horses are passionate about riding, otherwise they wouldn’t put up with the long hours, danger, and financial instability that is an inevitable part of the horse industry. On the other hand, staying in business means showing almost constantly and the decision to show is seldom a reflection of the amateur rider’s competence or the horse’s welfa Show Barn Blues brilliantly captures the bizarre social dynamic present at so many show barns: on one hand, on some level most professionals who work with horses are passionate about riding, otherwise they wouldn’t put up with the long hours, danger, and financial instability that is an inevitable part of the horse industry. On the other hand, staying in business means showing almost constantly and the decision to show is seldom a reflection of the amateur rider’s competence or the horse’s welfare—it means that the barn owner needs to make money off of the training fees, braiding fees, and pro rides that showing at a high level entails. Grace, the heroine of the novel, is a veteran rider, trainer, and barn owner who is struggling to stay afloat in a suburban world where horses increasingly seem irrelevant. Her shaky finances (and control freak nature) occasionally blind her to making the best decisions for her horses, including their need for some downtime and to just be horses riding around on a trail. Kennedy, a boarder Grace takes in only reluctantly out of desperation at the beginning of the book helps remind Grace why she loved riding so much in the first place while Grace teaches Kennedy some needed firmness about being a professional in the horse world. What I love so much about this book and all of Natalie Keller Reinert’s books is that there is no black and white when it comes to horses: it’s not like the people who show are bad and the people who trail ride are good. There are clearly strengths to both and a need for both freedom and discipline when it comes to horses. Making money is a part of life but focusing on winning blue ribbons alone can limit a rider’s development as a horsewoman. I would recommend this book to anyone who loves horse fiction that is willing to tackle serious themes with a sense of humor but particularly to hunter-jumper riders who will likely find themselves nodding and laughing as they recognize so many of the characters from their own ‘real life’ barns! This book left me cold. I am sorry but it was not written from a good perspective- the characters were shallow and insipid and there was not enough detail in the horse training/ showing. Some of us are not familiar with American ways of Equitation- so I was disapointed to say the least. Unfortunately I got very bored reading this and the most exciting part was the fire - the gallop home was much better, but then there was too much dialog before you found out the fire brigade has been called and t This book left me cold. I am sorry but it was not written from a good perspective- the characters were shallow and insipid and there was not enough detail in the horse training/ showing. Some of us are not familiar with American ways of Equitation- so I was disapointed to say the least. Sequel it needs one, I was so not ready for Graces story to end! Really enjoyed that this story is about a horse trainer holding onto her land against the evil land developers! The writing here isn't the best I've seen, but it was certainly fun to spend a few days in a 'horsey' world. Horse people will enjoy this. I read this book after reading Pride (even though it was published before), and it didn't make a difference at all. It just read like extremely well-detailed backstory. I loved the struggle Grace faced on a daily basis with handling her students' every question or complaint, and the ever-looming development companies constantly drowning her in brochures and unwarranted visits. Add the usual stress of round-the-clock horse care and ever-piling bills, and it was a realistic (though not dream-crush I read this book after reading Pride (even though it was published before), and it didn't make a difference at all. It just read like extremely well-detailed backstory. I loved the struggle Grace faced on a daily basis with handling her students' every question or complaint, and the ever-looming development companies constantly drowning her in brochures and unwarranted visits. Add the usual stress of round-the-clock horse care and ever-piling bills, and it was a realistic (though not dream-crushing) peek into running a successful riding stable. Okay, so I identify with Kennedy on a spiritual level. I was the "weirdo" at my barn who thought ponies were rad, and who just wanted to spend time grooming and loping around the arena or trails. I wanted my "special horse" that I didn't care about moving up levels or worrying about its fitness or value, who was just my buddy. (Thankfully, I had an instructor who did not mind one bit and fully accepted that. Thanks, Kathleen!) So I actually LOL'd at Grace's internalized thoughts on Kennedy's application and her fight not to cringe or twitch when Kennedy would just be like "Okay, everyone, trail-riding party!" Because that's totally something I would do. As with Natalie's other books, the descriptions of the Florida environment was bar-none, which is especially helpful since it's an area of the U.S. that I'm completely unfamiliar with. The scenery, the differences in climate and location, the weather patterns...Natalie painted a complete picture in my mind of a place I've never been to before. Awesome. This was a fun read because of the characters involved and the typical attitude that my daughter and I used to call "as the barn turns". The descriptions of Florida were quite a bit different in "Blues"than in many of my previous horsy type books. Look forward toa few more of these quick reads. Satisfying, enjoyable, fun. Learned a lot about Florida. Nice how the story intertwines with Jules's story. Really enjoyed this one. Having grown up watching my riding country shrink through ever-encroaching development, I totally related to the main character and her feelings of despair as the land around her changes rapidly. Memorable characters, both human and equine, shine in this book. A very good read! Author of contemporary equestrian fiction and historical romance. After twenty years of working with countless horses in half-a-dozen disciplines, Natalie Keller Reinert settled down to write about Thoroughbreds. From the short stirrup classes at dusty hunter/jumper shows in Florida to the inner dirt at Aqueduct Racetrack in New York City, it's always been about the Thoroughbreds. Natalie lives in Author of contemporary equestrian fiction and historical romance.